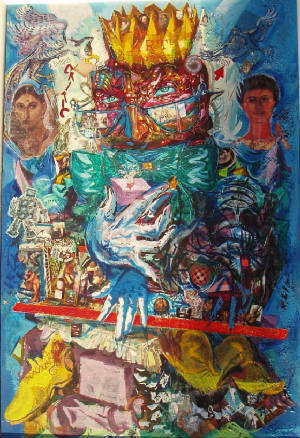 The exhibition "A Thrilling Act: the Art of Anthony Eterovich (1916-2011)" will tour to the Southern Ohio Museum in Portsmouth, Ohio in September of 2018. The show will be up from September to November. Painting is "a thrilling act...It encompasses a battleground of contradictions all to be resolved without compromise." "A Thrilling Act: The Art of Anthony Eterovich" opened to the public on Friday, April 15, 2016 at Tregoning & Company galleries in Cleveland. This centennial retrospective had two extensions and closed on July 30, 2016. Mr. Eterovich's work is represented by Tregoning & Company and is available for touring. Read our review by Josh Usmani in Cleveland Scene. Listen to Cleveland Arts Prize Winner Dee Perry's interview with Bruce Checefsky, CIA Reinberger Gallery Director and Gallerist, Bill Tregoning on IdeaStream's Sound of Applause. Listen to Vivian Goodman interview NEA Grant Winner, George Kozmon on WKSU 89.7. Watch our PBS Documentary produced by #Dennis Knowles & the IdeaStream "Dream Team" here. Please click on the painting-detail buttons above for more information. The purpose of this site is to share the paintings, drawings and philosophy of Mr. Eterovich with the public and to promote the Anthony W. Eterovich '38 Memorial Scholarship, which provides support to exceptional drawing students at the Cleveland Institute of Art. If you would like to make a contribution to this scholarship, please contact the Office of Institutional Advancement at the CIA at 216.421.7410 or giving@cia.edu. "Always feeling kingly, with righteous opinions, he finds himself constantly on the run - is there a cutting edge out there? Where? Echoes of the past? What yardstick to apply? Will flying messengers give him a clue? On what pedestal should he place it? With lyrical drawing and contrasting color, while adjusting his bow tie with one hand, the other hand moves on the ruler for a numbers rating system. Echoes of early to present pay masters are in his mind from which he projects future evaluations."